In a relay race the one holding the baton also holds the aspirations of the entire team. The race is won or lost in the ‘exchange zone’ where the baton is passed from one runner to the next. We all pass through exchange zones in life, times when crucial insights are given and received. We need to know what to do when we get there. Author Terry Bone takes profound truths about transitions and makes them easily accessible to the reader. Everyone loves a good race. As a young adult in the 1980s, I was in awe of the ‘Golden Milers’, an elite group of athletes who constantly set new world records for running the mile. But my favourite was the 26 mile marathon. It seemed so extreme. Not so any longer. Since the ‘X Games’2 debuted in 1995, racing events have been getting longer, wilder and more dangerous. Pounding the pavement for 3 hours? Barely worth being called a marathon anymore. Now we have week-long mountain Death Races and Peruvian Jungle runs where broken limbs are optional but not unexpected. And how about the ‘Yukon Arctic Ultra Marathon’, a 300 mile winter endurance footrace in which you pull your own supply sled? In 2018, twenty-one people began the race in temperatures below -40C/F. Eleven days later, exactly one person crossed the finish line. The rest dropped out, losing not only the race, but also toes, fingers and even whole feet to frostbite.3 In spite of such stories, new extreme races are constantly appearing with no signs of abatement. you don’t have to be an adrenaline junkie or extreme athlete to win! Many people with ordinary abilities have entered with low expectations only to experience the joy of standing upon the medal podium when it’s over. So what is this race? And why is it the most amazing one? Your personal destiny is not a call to individual greatness - it is a team event. In this opening section, we will discover how life becomes an ‘Amazing Relay Race’ when differing generations meet in life’s exchange zone. We will also discover how profoundly generational thinking will impact your important life decisions. Your personal destiny is a team event. The baton pass defines the outcome of the entire race. There is a way to create generational permanence in what you are called to do. Chapter 2 identifies and celebrates the EMERGING GENERATION. This generation is producing a great number of potential World Shapers, whom we define as persons who will noticeably influence and impact the sphere in which they live. Chapter 3 goes beneath the surface of success to discover the timeless truth of the idea of COVENANT. It examines how the ‘thousand generation’ promise God made long ago is still relevant and powerful for every follower of Jesus today. Chapter 4 is a modern day account of restoring lost destiny. Using a light-hearted manner, Terry tells a story of how the amazing grace of God overcame generations of unbelief and negative patterns, when just one generation chose to turn back to God’s ways. Part Two is devoted to understanding the unique set of challenges faced by each of three generations on the road to creating permanence. Each leg of a relay race has unique elements depending upon the shape of the track where the baton is being passed. Likewise, each generation of believers will face unique challenges in their faith relay. These principles apply not only to faith but also any form of leadership. Chapter FIVE provides an overview of predictable battles the three generations will face on the pathway to permanence. Chapters SIX through EIGHT deal with the individual challenges of each generation. The First, or Pioneer Generation, fights the Battle for Dominion, the right to rule. A pioneer is called to establish something new by leaving the comfort of familiar culture. A second generation person is called to connect the founders with the future. They take the newly established culture passed to them and link it to the generation that follows them. The Third, or Occupier, Generation fights the Battle for Permanence. A third generation leader or believer is called to capture the available momentum from the previous generations and turn it into an unstoppable force for the generations that follow. The Exchange Zone is a track and field term for the marked area in a lane of track where two relay runners must meet and exchange the baton. This part of the book deals exclusively with the ‘what to do’ and the ‘how to do it’ in that zone. 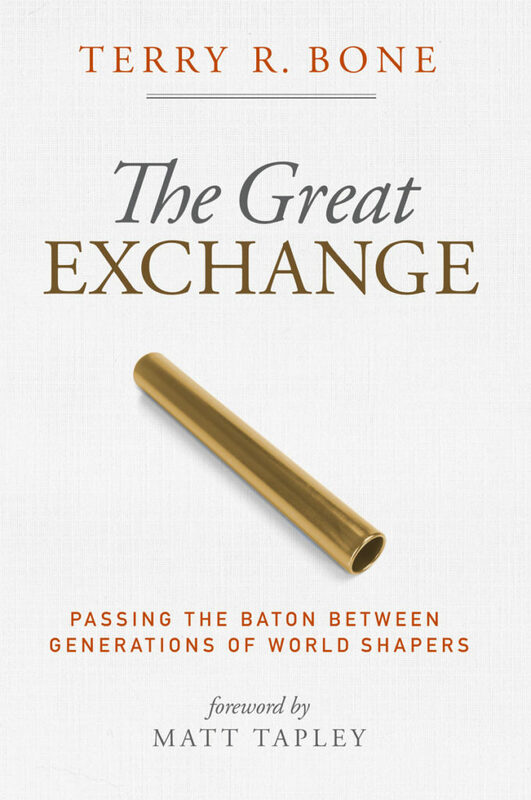 These are principles that span all applications of passing the baton between two generations, including the batons of faith, of leadership, and also the business world. We all have some amount of emotional baggage. This chapter will give an overview of what’s typically in that bag and how to set it down. Anointing is defined as the unique blend of Spiritual authority and ability that each of us carries as followers of Jesus Christ. This chapter will discuss how to understand what you carry and how to bestow it upon the next generation. Getting the timing of transitions right is always crucial. This chapter discusses how to not miss the moment by investing in the right people at the right time and learning to discern the voice of God in the process. Other-centered behavior is simple to understand yet eludes our grasp all too often. This chapter examines the profound generational consequences that follow a lack of prioritizing those who follow after us. this right using human logic alone. It is possible to live in such a way that the Blessings resting upon one life are transferred to the lives of others for many generations. Part Four reveals three key components for making this a reality in your life. This chapter reveals a deep and powerful truth. It has to do with your relationship with God’s promise to Father Abraham. In this chapter all political viewpoints of modern day Israel are temporarily set aside in order to think of Israel only as Abraham’s family. This chapter reveals and examines time-tested methods for creating spiritual momentum within your family. How to get answers that span generations and how to go beyond what you normally would ask or think. This chapter sums up our great relay race of faith with a brief inspirational message based upon Hebrews Chapter 12. Special attention is given to the final or ‘Anchor Leg’ of your race. Terry is an Author, Leadership Coach and Consultant. He serves church leaders, business persons and missions workers by assisting them to make excellent life transitions. Terry worked as a software systems analyst before becoming an ordained minister.